Frankly I have my doubts. I honestly would not have remembered said illness if I hadn’t blogged about it. Besides, I clearly have the worst cold of my adult life right now, just at the start of 2014. I can’t even blame this one on air travel because that wasn’t a part of our holiday plans this year as we now live so much closer to our families. There was a great deal of togetherness spread over the holidays, on both sides of the family. Food was eaten, games were played, germs were shared, and rainbows were loomed. If you happen to have an American grade schooler in your life, you no doubt understand what I’m talking about, but in case this phenomenon has not reached your corner of the world, I’ll explain. The latest craze to hit grade school is these bracelets made by linking together small colorful rubber bands. There’s a special loom you have to buy and then there’s about a gazillion patterns you can make. And like all of these fad kid crafts, the more complicated the pattern, the greater the cool points. First of all, WHAT?! Just who is trying to buy more than 20 of these things? I bought one, which earned me a few cool points with my son. It turned out his cousin also received rainbow looming gear for Christmas and so the holiday saw all of us adults sporting a lot of rubber bands as the cousins got to work sharing looming secrets and exchanging highly sought after colors. Because no one knows what color that really is. And I do mean no one. Rainbows have been formally studied since Aristotle. Likely it was Shen Kuo of 11th century China who first more or less accurately explained how rainbows occur. But it is Isaac Newton we have to thank for this most troublesome of colors indigo. 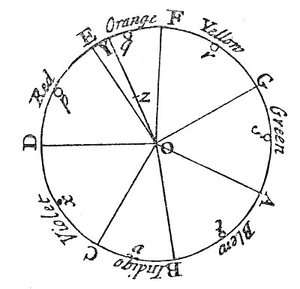 In 1672 he published a study detailing the color spectrum. His initial description included five colors and then, a few years later, he added orange and indigo because he thought it would be “pretty neat-o” to have the same number of colors as there are musical notes, days in the week, and known heavenly bodies. And it would have been, except that we now know that there are nine planets in our solar system (just back off, all you Pluto-haters!) and that, really, Newton has just gotten us into a whole mess of disagreement. 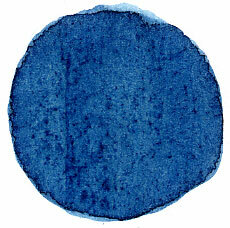 It even turns out, when we talk about indigo, we probably aren’t talking about the same color Newton was describing. What we call indigo, he called blue and what he called blue is more what we think of as cyan (or blue green if, like me, you prefer the Crayola color spectrum). So why is indigo still there? I think we have to blame Mr. Roy G. Biv for that. Of course we owe him a lot. Without Mr. Biv we would have a terribly difficult time remembering the order of the color spectrum and I love a good pneumonic as much as the next gal, but I think I have a solution for that. How about Ronnie Only Yodels Great Big Vocals? It’s a work in progress. I’m certainly open to family-friendly suggestions. But I think with a little tweaking it could take off, just like the way we all learned the order of the planets in our solar system: My Very Educated Mother Just Served Us Nine Pizzas (or as the Pluto-hating scientists would prefer: My Very Evil Mother Just Served Us Nothing). I will not learn to teleport. The rainbow loom will go out of fashion and the braided embroidery thread friendship bracelet will make a comeback. Indigo will at last be expelled from the rainbow. Pluto will be reinstated as a planet thanks to the hard work of the advocacy group Very Educated Mothers for Pluto. I will have the worst cold of my adult life on the dawn of 2015. Great slogan! I’m thinking about starting a petition. Is indigo in the rainbow? Find something that is, experts agree, indigo. Measure the wavelength of the light coming off of it. Get a prism. See if you can find that same wavelength in the light split by the prism. If it’s there, indigo is in the rainbow. There is some variance in the wavelength of indigo according to experts throughout history. I actually don’t doubt that it exists or that it is in the rainbow, but as it has long been a fairly ambiguous color and it can’t conveniently be fit into the traditional color wheel, I think it’s hard to claim that it is crucial to include it in our layman’s description of the rainbow, whether we can agree that it is present, or not. In that case, check this out; you’ll believe in Indigo after you hear it. hahahahha Fascinating post. We must have indigo because I wrote a poem about it. The indigo again be the “simple Indigo”, and that winter 2015 is a good reason to stay very close family. Hug! Thanks! My boys have been taking very good care of me today. I am feeling the love. Nothing better than caring son. Cheers! Ahhh, the friendship bracelet. I made some of those in my day! I hope you feel better soon – I’m actually getting over a bad cold too. I could have used a tissue cozy for Christmas as well. Uggh. What is it about the holidays? I’m glad to hear you’re on the mend. There’s a domestic flight company in India brand-named Indigo who are very fond of the color. They’ll probably be devastated if Indigo is banished from the rainbow! I bet with a clever ad campaign they could make the change work for them. “The only indigo in the sky worth mentioning” or something like that. More importantly, though, what color are their airplanes? Have they settled the dispute?